About Advanced Laser Medspa | Advanced Laser MedSpa - Michael Salzman, M.D. Located in Clifton Park, NY, Advanced Laser Medspa represents a group of licensed laser specialists and skin professionals working under the leadership of Dr. Michael Salzman. We use the latest lasers and equipment for all of our treatments including acne, body contouring, wrinkle reduction and rosacea. Our advanced body contouring inches off treatments are pain-free results without medication or bruising. We have the latest in comfortable facial wrinkle treatments for the eyes, face, mouth lines, jowls and neck with a variety of options including needle-less treatments. Our Doctor is an advanced injector on-site full time and uses BOTOX®, XEOMIN®, DYSPORT ®, RADIESSE®, VERSA® the RESTYLANE® line of products including SILK® for finer lines and wrinkles and KYBELLA® for permanently reducing double chins. Dr. Salzman is the only physician in upstate New York who can treat both toenail and fingernail fungus with a high strength laser while using a unique cooling device for your comfort. We also have hair removal lasers that can treat all skin types. Now in our 15th year, we combine our knowledge with the latest in skin care treatments and technology for the best results. We use the highest medical grade products for use at home and in between treatments. Come visit us and experience a personalized free in-depth consultation with photos, quality treatments, and excellent customer service. We proudly serve clients in Clifton Park, Saratoga, Albany & the surrounding areas. Under the leadership of Michael Salzman, M.D., the mission of Advanced Laser Medspa is to renew, revitalize and improve your skin. We are committed to providing you quality professional medical spa services with quality medical grade systems, lasers and products. Through our educational consultations and treatments we focus on your goals and provide you with quality care plans for your Medspa visits as well as your home care plans. 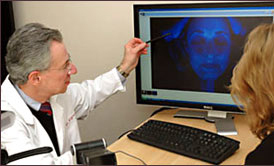 We provide quality service by medical professionals, licensed laser technicians and aestheticians. We also have the area’s most competitive pricing. Our Beauty Services include popular procedures performed by Dr. Salzman, such as BOTOX®,XEOMIN® and DYSPORT® for wrinkle reduction. These wrinkle reducers are generally applied to reduce wrinkles, most commonly known as the eleven’s (11’s), the frown lines between the eyebrows, the forehead and squint lines and smile lines. We use dermal fillers to fill in deep facial lines, lift cheeks and plump lips. Products include JUVEDERM®, RADIESSE®, VERSA® and the RESTYLANE® line of products including LYFT®, REFYNE®, DEFYNE® and SILK®. WAXING: Many clients have asked us to perform waxing services, which we now have added to our menu of services. We limit this to facial areas including brown and facial vellus hair. We also perform specialized facials and even Cellulite Treatments, most popularly on the thigh areas using our Radio Frequency treatments with out ENDYMED Pro sometimes in combination with our ZIMMER Pulse Therapy..
Another popular treatment is Cool White Smile, a teeth Whitening procedure that takes under 45 minutes to perform. Many of our clients come in yearly for this treatment, or as needed depending on how much coffee, wine or other habits result in teeth discoloration. Advanced Laser Medspa was the first facility in upstate New York to utilize the Clear Concept Acne system developed by the former head of the American Dermatology Association. Currently our system protocols are first determined by a complete evaluation of the individual using our sophisticated digital photography and a review of prior systems and medications used. Depending on the consultation, a combination of facial treatments including acne facials, extractions, micropeels, lasers, radio frequency, LED (Light Emitting Diodes) and medical grade products specifically designed for acne, including powerful growth factors may be recommended. One of the most popular treatments we provide is laser hair removal for men and women and all skin colors and types. Our lasers are gentle enough for a women face and also strong enough for a man’s beard and for facial and neck bumps common for some men. We currently have some of the most advanced lasers which provide excellent hair reduction for all body areas including lip and chin, backs, bikini and Brazilian and arms and legs.